Happy Kitchen Sink Stamps Monday, I hope you have a wonderful Christmas weekend! If you are in need of some Christmas Thank You cards, the new Multi Step Invisible Snowman makes for some cute and quick cards. 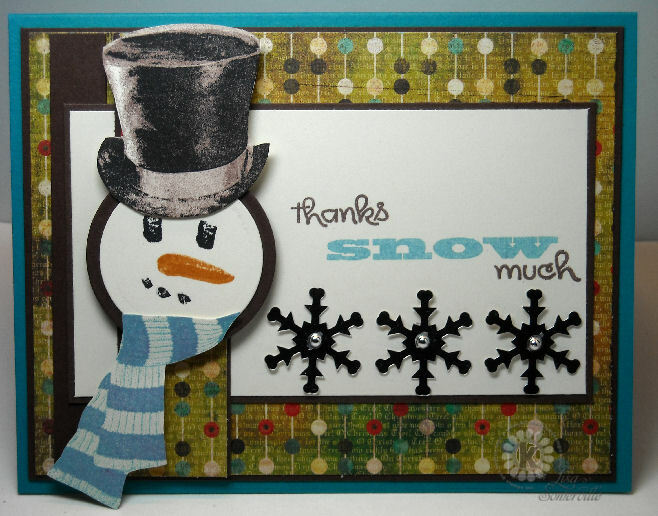 Inspired by this weeks CPS Challenge (I used CPS Sketch 155), I created today's card using the Multi Step Invisible Snowman and some card stock and paper scraps. Shop the Kitchen Sink Stamps After Christmas SALE and save 20% on everything in the store! Through Midnight December 28th, when you enter code HOHO20, you'll save 20% on your Kitchen Sink Stamps purchases, not only that, but you'll receive FREE shipping when you spend $50! Don't forget to mark your calendars and plan to join myself and other members of the KSS Crew as we welcome you to the Grand Opening of the KSS Forum/Gallery this Friday, New Year’s Eve. The KSS Crew will be in the forums from Noon to Midnight EST, there will be plenty of fun Challenges, Games, Prizes, and Giveaways - I'll see you there! He is adorable! Sweet card! I will be expecting it in the mailbox shortly. LOL! He is just snow cute! And thanks for the info for NYEve. How sensational for those Christmas thank yous!! Great work with this wonderful set, Lisa! This is just darling, Lisa! Love your snowmand face...to fun!! Hugs!! The snowman is darling and so perfect for the thank you cards. Thanks for joining us at Gingersnap Creations. He is adorable!!! Love the frosted hat! Happy New Year! darling snowman! Hope you all had a wonderful Christmas! What a sweet way to send thanks through the mail! The snowman & hat are just plain cute! I hope you're enjoying a wonderful Christmas season and wish you the best new year of all! 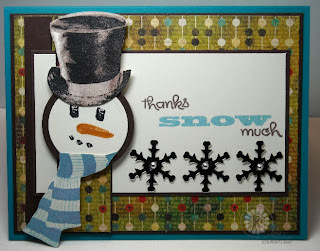 What a cute little snow guy ... love how the layered stamping gives such great dimension on his hat ... thanks for joining the Snow People fun at Gingersnap Creations.